Ewelina Nowicka, born in Gdańsk, Poland in 1982, is a Polish violinist and composer. She has been playing the violin since she was six years old and started composing at the age of eight. Nowicka completed her studies in Germany. In 2007, she earned her Master’s degree with honours, in violin and music pedagogy, from the Hochschule für Musik und Theater in Hamburg, in the class of Professor Petru Munteanu. 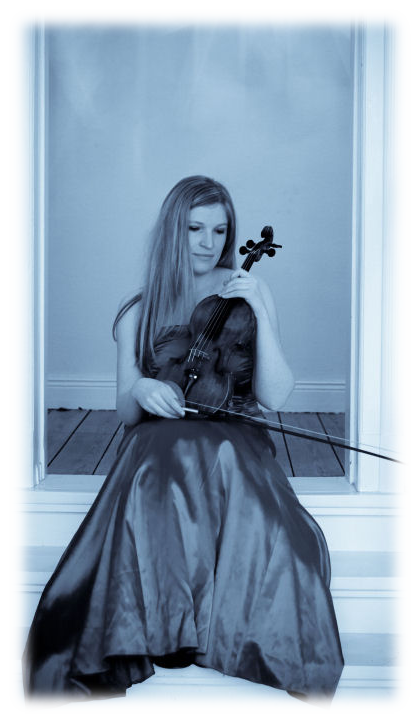 In 2009 she completed her violin graduate studies at the Bremen University of the Arts and later passed her concert examination under Prof. Katrin Scholz. She has won many prestigious awards at international and national violin competitions, i.e. she received an award from the Hessian Radio, Frankfurt am Main, Germany; the second prize at the International Violin Competition at Goch (1997); the first prize at the National Chamber Music Competition in Wrocław (2001); the third prize at The Elise Meyer Competition in Hamburg (2003); and finally, the third prize at the Moderne Solo Streicher Competition in Bremen, Germany (2008). In 2014 Ewelina Nowicka was nominated for Coryphaeus Music Award 2014 ´Personality of the Year´ in Poland. She made her solo debut at 16 with the Polish Baltic Philharmonic in Gdansk. Since then, she has performed with many other orchestras, including the Bremerhaven Stadtorchester, Lviv Philharmonic, Chamber Orchestra of Polish Radio ´Amadeus´, Sinfonia Varsovia, Polish National Radio Symphony Orchestra in Katowice, Cracow Philharmonic Orchestra, Orchesterakademie NRW in Düsseldorf and others. Her repertoire includes concertos by Mozart, Paganini, Wieniawski, Tchaikovsky, Glazunov, Stravinsky, Saint-Säens, and many others. In 2001, she discovered a unique set of violin concertos by Ludomir Różycki and Ignacy Jan Paderewski. She then gave Polish premieres of these pieces and recorded them with the Polish National Radio Symphony Orchestra, the Szczecin Philharmonic Orchestra and the Baltic Philharmonic Orchestra. In 2011 a CD with the violin concerto by Ludomir Różycki as well as some of her transcriptions of the ballet ´Pan Twardowski´ was published within the label Acte Préalable in Warsaw. During her research about the life of Dmitri Shostakovich, Ewelina discovered the composer Mieczysław Weinberg, who is hardly known in Poland, despite of his polish origin. Impressed of his life and works she played premieres of his violin concerto in G minor op. 67, Concertino op. 42 and the ´Rhapsody on Moldavian themes´ op. 47, some of which were recorded and published on CD and DVD. She also arranged a missing version of the ´Rhapsody on Moldavian themes´ for violin and orchestra, which was later published by Peer Music. In 2013, Ewelina Nowicka recorded with pianist Milena Antoniewicz for the label RecArt a CD with works for violin and piano by Mieczysław Weinberg. This CD was nominated for the music award Fryderyk 2014 of the Polish music industry. She has taken part in many music master workshops with such famous teachers as Wolfgang Marschner, Thomas Brandis, Krzysztof Węgrzyn, Petru Munteanu, Katrin Scholz, Mieczyslaw Lawrynowicz, Herman Krebbers, Krzysztof Jakowicz, Konstanty Andrzej Kulka, Wanda Wilkomirska, Takaya Urakawa. For many years, Ewelina has been composing and co–operating with such other composers as: Michael Volpe, Krzysztof Olczak, Stanislaw Moryto, Peter Michael Hamel, Elisabeth Sikora, Helmut Zapf, Eugeniusz Glowski, Matthias Jann, Sebastian Stier, Georg Hajdu, Manfred Stahnke und Helmut Erdmann. She enjoys performing her own pieces with professional orchestras and choirs. In 2008, she received an award at the Jugend Komponiert (Composing Youth) Competition for her violin and piano piece, Kaddish 1944, which was inspired by a letter from her great aunt in the Łódź Ghetto. She also won prizes for her concertos, ´Ebraico´ and für ´Amadeo´. During the same year she also won the Bremen Composition Prize. In 2009, she was one Crossover Composition Award recipients in Mannheim for her piece ´Jongleurs´ for two violins published by Verlag Ries & Erler. Since 2010, her compositions have been published by Verlag Neue Musik in Berlin. The cooperation between Verlag Neue Musik and Kreuzberg Records made also her first debut album with works for violin and piano possible. Ewelina Nowicka has been awarded scholarships from among the following institutions: The Polish President Aleksander Kwaśniewski Scholarship (1999), The Ministry of Culture Scholarship (1999–2001), Otto Stöterau–Stiftung Scholarship (2001–2005) and the Oskar und Vera Ritter Stiftung 2009–2010). Apart from her achievements as a soloist and composer, Ewelina Nowicka also teaches violin, chamber music and orchestra at the Staatliche Jugendmusikschule in Hamburg. She is a member of of the German Composers Association, GEDOK Hamburg (Community for Artists and Art Patrons) and ESTA Germany.